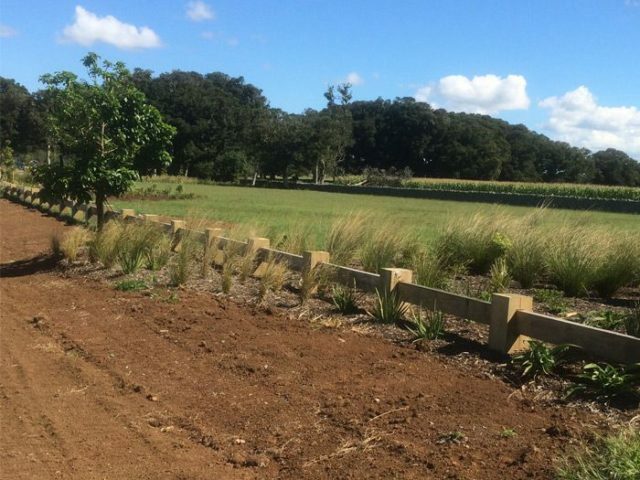 The BTD INTERLOCK® mortised single rail fence option will enhance the look of your property and add value to your investment. It can be used in a rural or urban setting, on your properties’ boundaryline, your subdivision,drive or on your roadside boundary. Property developers and councils find this option particularly suitable in subdivisions to define grass areas and footpaths or car parking areas. Where you are wanting to maintain an open feel but need to stop traffic from entering your property, this option is ideal. The standard post size is 125mm sq but is also available in posts up to 300mm sq and rails are 1.800m long. Both the timber and processing is unsurpassed in the fencing industry as we purchase superior grade saw logs for milling, which are a higher grade than is normally used for fencing components. The rails simply slot into the precisely machined posts and the beveled post tops marks this as a premium fencing option. Recently the fence of choice in the Waiawa Subdivision in Bethlehem, Tauranga and the Karanui subdivision in Kamo.